NASCAR Sprint Cup drivers Brad Keselowski and Joey Logano and their Penske team wish this wasn’t the case, as they have a lot of work to do to get the two cars ready to race again from an incident on lap 19. Unfortunately, the race was red flagged for thunderstorms on lap 22, which leaves both teams high and...well, not dry. Keselowski was sorry that his teammate was collected when his car got loose. “I felt like I had a normal line and it went crazy sideways on me,” Keselowski told NASCAR. Sprint Cup only has rain tires for use on road courses, so when it gets wet on an oval, everyone’s out of luck. Everyone at Bristol Motor Speedway hopes the race can resume today, although the broadcast on Fox ends at 4:30 PM. If the race restarts today, NASCAR has announced that the remainder will be shown on Fox Sports 1. If it restarts on Monday, it will be broadcast at 11:00 AM ET on Fox. You can follow all of NASCAR’s weather updates for BMS here. UPDATE (5:53 PM): Dryers are on the track right now. 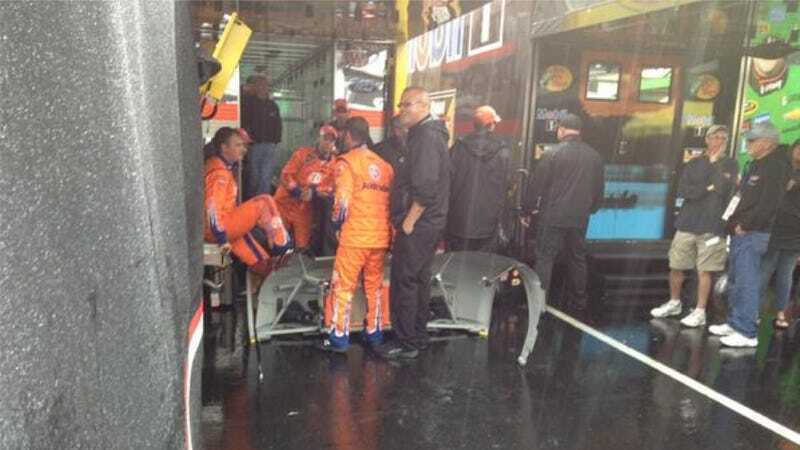 NASCAR hopes to resume the race in about an hour. UPDATE [6:30 PM]: The restart is a go! The telecast resumes at 6:30 PM on FS1.